See Jane. : Well, is it? Is it a Zentangle? Well, is it? Is it a Zentangle? So I missed last week's Diva Challenge due to being too busy. End of the school year, starting up an online class with Joanne Sharpe, and the every day life. 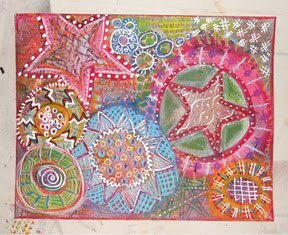 This week's challenge is to create a piece of work just doodling....NOT using Zentangle patterns. I've already been trying to do this with Joanne's class. You know what? It's hard! I just don't feel at peace, not grounded. Interesting. With Zentangle I can just think what I want to put in a section created by the string. With the doodle, I looked around me and came up with something from what I saw. I finished this up during a break from TEDx presenters in Manchester, VT today. You can see the brick wall, the hubcaps, and some funky spiky grasses from my kayaking yesterday. I think almost everyone agrees, we do like a 'normal' zentangle more. Though you managed to make this beautiful! Oh yes please bring back our tangles!! But your tree is wonderful, I love it. Seems like everyone found this one a challenge.... to much thinking! I love your tree. Very nicely done! It is nice to see that I was not alone with the anti zen of doodling. Your tile and tree are beautiful though!